“Awake! Awake!” Deborah cries, recounting the Israelite route of Sisera’s Canaanite army, “Strike up the chant!” In words and paint, this book presents three biblical stories of women who stood up at crucial moments to take actions that not only preserved the nascent nation of Israel but also shaped its character. The illuminations that I offer here attempt not only to shed light on these deeds of three millennia ago but also to convey these biblical women’s very human dramas. 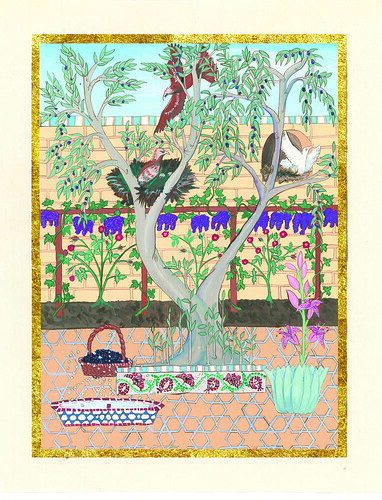 The illuminations of these stories afford an opportunity to expand our experience and understanding of the biblical textual tradition by using visual imagery to convey not just aesthetic pleasure or narrative illustration—as delightful and meaningful as they are—but also the many layers of meaning embedded in the traditional interpretations of these biblical stories. I lead you into this range of meanings, this visual midrash, along a path strewn with a wide visual symbolic vocabulary adapted not only from the stories at hand but from a virtual ocean of related Jewish text traditions and from archaeology, diverse elements of Western culture, modern science, and my own experience as a twenty-first-century Jewish woman. Let me introduce you now to the origins of this work, the essential themes flowing through it, and the means by which I create these visual interpretations of the biblical texts. This book bears intense personal significance for me, quite apart from its aesthetic and cultural value. The work is a tribute to my late husband, David Louis Band. After a noble seven-year struggle with a rare spinal-cord cancer, David passed away in our home on March 16, 2009 (21 Adar 5769), at the age of fifty-two. This project, the fruits of a second partnership with my father-in-law and mentor, Arnold Band, is our way of memorializing David’s hesed (loving-kindness), his strength, his learning, and his commitment to the historical community of Jewish men and women. Shortly before David’s passing, my father-in-law suggested that I address the Deborah story from Judges 4–5. This story of war and women’s bravery was David’s bar mitzvah haftarah—and he loved it! A scientist to the core of his being, utterly absorbed with his work in astrophysics, as well as deeply learned in the Jewish sources, David also enjoyed a lifelong fascination with military history and was deeply devoted to, and profoundly knowledgeable about, every corner of the Land of Israel. Thus, despite being a truly gentle and peace-loving man, he relished each opportunity to chant the blood-and-guts war story before our synagogue congregations during its annual reading accompanying the story of the crossing of the Red Sea. The haftarah meant so much to him that a few nights before his passing, our younger son chanted it for him in the quiet hours before dawn. Thirty years earlier, the coincidence of David marrying a woman by the name of this very heroine became one of the factors that early led us to believe our marriage to be truly bashert (divinely intended), and that fact, along with his admiration for my care of David through his illness, led my father-in-law to propose the project. I quickly decided to augment this brief story with the full Book of Ruth, the Moabite ancestress of King David, and the story of Hannah, recounting the miraculous birth of the prophet Samuel, who identified and appointed the first two kings of Israel, Saul and David. Together, these stories of Deborah and Jael, Ruth and Naomi, and Hannah represent the full extent of coherent women’s narratives in the Hebrew Bible (with the exception of Esther, which is at least as much Mordecai’s story as Esther’s). And, as I will discuss shortly, my experiences of these recent years have led me to crucial aspects of the way I present these tales. More important to the reader than our personal motivations, however, these stories offer an opportunity to probe experiences and values fundamental not only in the communities of biblical Israel but in the lives of all women and men who derive inspiration from the Jewish biblical heritage. Indeed, these tales of women’s leadership, courage, kindness, and devotion to one another celebrate qualities and emotions common to all humankind. Remarkably, when read together, these stories suddenly reveal a striking synergy of human qualities that Israel and its descendant religious communities have sought to emulate across the millennia since their composition. Remarkably, in each of these stories, it is the women rather than their more materially powerful male companions who lead in exemplifying these qualities. The Deborah story is remarkable for being the first successful effort at uniting the tribes (or at least most of them) to repel a common enemy. Deborah’s efforts are characterized by her courage (in which she is joined by Jael), strategic shrewdness, and faith in prophecy. The overwhelming quality that suffuses Ruth’s idyll is, of course, hesed, loving-kindness. After her father-in-law’s initial abandonment of Judaea—which may be regarded as emblematic of the chaos of the period of the Judges—all three major actors and even the unheard, but nonetheless involved, Bethlehemites do the right thing at the right time to guarantee their collective security and happiness as individuals, as a family, and (unbeknownst to them) as progenitors of the Davidic dynasty. 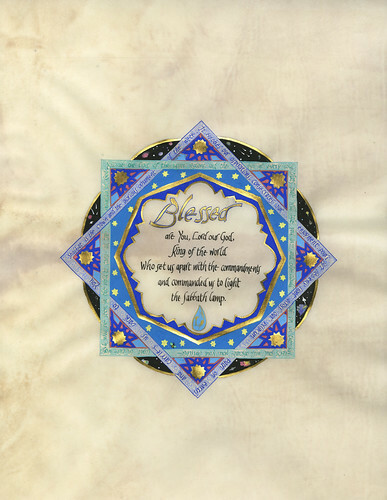 Hannah’s prayer for children, her commitment to give her first child to divine service and still attend to his needs even afterward, exemplifies devoted parenting. Her quiet plea to God in Shiloh not simply models silent prayer, it actually invents such devotion within Israelite tradition. We will see in the illuminations and literary analyses ahead that in these three stories, courage, faith, loving-kindness, prayer, and wise parenting, all modeled primarily by women, become the guiding values and the moral foundation of the Israelite nation. These tales draw their power not only from the particular experiences they relate but also from the resonances they strike with the full sweep of biblical text and Jewish history and, in many instances, from universal human experience. For instance, to the sensitive reader steeped in the biblical epics, the words of Megillat Ruth frequently evoke the hand of the providential God not only at Boaz’s threshing floor but also at the shores of the Red Sea. Hannah’s pain at her childlessness resonates not only with the whole panoply of biblical women who had difficulty bearing a child but also with many women who struggle with childlessness even today. As you will see, through my choice of imagery, I am able to conjure up the religious, national, and emotional values inherent in these human situations and stories. My goal in composing the paintings and choosing imagery certainly begins with bringing you, the reader, aesthetic and sensual pleasure. Beyond that, I attempt to envision the events and highlight the authors’ intent and to illuminate the text’s diverse values, whether narrative, psychological, spiritual, historical, or political. The paintings in this book, portraying as they do stories of such different situations, nonetheless draw upon a similar set of influences and sources. Pursuits as diverse as traditional rabbinic biblical exegesis, modern academic biblical scholarship and historical inquiry, archaeology, twenty-first-century concerns with ecology, and, of course, my own imagination have all figured in my reflections on these tales. I offer you here the fruits of these combined influences. Let me explain their roles within this work. The first obligation in interpreting the text—whether visually or verbally—is to understand the meaning of the verses both at the time of the described events and at the time they were redacted. Here, modern academic biblical scholarship and literary analysis reveal the subtleties embedded in the words. However, imbued as these stories are with multiple layers of ethical and spiritual messages, classic rabbinical exegesis offers another essential tool for uncovering their meaning. These sources invariably begin with Rashi, the essential eleventh-century French scholar whose commentaries on every book of the Hebrew Bible have been regarded in traditional Judaism as the lens through which any biblical text must be understood. Apart from Rashi, the Targumim—the Aramaic paraphrases of the original Hebrew texts that were used in Byzantine-period synagogues not only as translations but as explanations of these readings—offer additional insights into the stories from the perspective of the communities of that day. These two sources, however, intend to elucidate the literal meaning—the pshat—of the texts. The deeper symbolic meaning, the role of the text in the body of the overall Hebrew Bible, is explored in the midrashic literature. These fruits of centuries of discussions among ancient and early medieval rabbis, largely for homiletic purposes, contribute greatly to the symbolic vocabulary that I develop in crafting my own visual interpretations, my own visual midrash. I will explain what I mean about a symbolic vocabulary shortly. Our early twenty-first-century climate of ecological concern suggests an additional focus on how the early nation of Israel consciously derived its strength and traced its leadership from farm and shepherd communities close to the land, rather than from great cities and fearsome generals, as did the surrounding societies of Phoenicia, Canaan, Mesopotamia, and Egypt. Recent writings of Bible scholar Ellen Davis, of Duke University Divinity School, elucidate the significance of land and ecology in the Hebrew Bible and early Israelite law and custom. My approach to each of these stories, particularly Ruth, is greatly enriched by her understanding of the relationship between the soil of Israel and the people who grew their food and sacrifices upon it. Davis’s reading of Tanakh accompanies my use of the other sources discussed above to reveal the intertwined historical, spiritual, and material aspects of the stories. 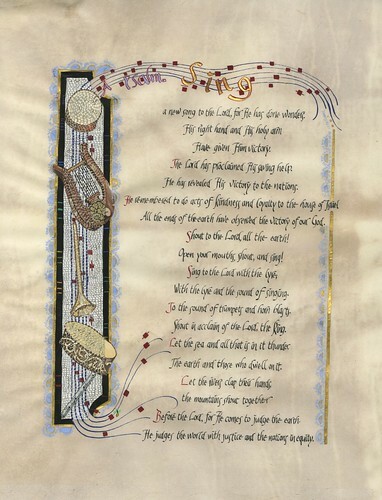 Readers of my earlier works, The Song of Songs: The Honeybee in the Garden and I Will Wake the Dawn: Illuminated Psalms, may already be acquainted with my approach to crafting visual interpretations of biblical text. As I have written in those works, my compositions begin with a representation of reality that makes sense in the world of our own experience—or, in the case of the present stories, from the biblical narrative. Following Erwin Panofsky’s analysis of “disguised symbolism” in the work of the masters of medieval northern Europe, particularly Van Eyck, a reproduction of whose Arnolfini Marriage Portrait has hung over my worktable since college, I introduce values and ideas related to the story at hand through symbolic images in ways that make logical sense in the narrative setting. While the overall painting usually creates a coherent, easily understood material reality, parsing the symbolism of individual items within it reveals a more complex world of ideas. In our increasingly visual age, when the word “icon” has sprung from relatively obscure religious and art-historical roots into everyday conversation, a vibrant Jewish visual vocabulary, able to convey complex abstract religious and national ideas in a glance, using imagery rooted in millennia of diverse Jewish sources, acquires a new relevance in Jewish society. Outside of the specifically Jewish world, this Jewish visual vocabulary may enrich the visual traditions of its descendant religions—primarily Christianity, whose own sources, including its rich complex of visual symbolism, ultimately draw substance and method from the Hebrew Bible and rabbinic midrash. It is this kind of Jewish symbolic vocabulary that I have attempted to develop in my work over two decades and for which this present project has offered such fertile soil. Within this book, as in my previous works, the full meaning of the symbolism, the full message of each painting, is laid out in the commentary that corresponds to each illuminated page. As far as possible, I clothe these ideas in imagery drawn from the period in which these stories take place, the twelfth or eleventh centuries BCE, that is, the late Bronze Age, early Iron Age decades immediately prior to the establishment of the Israelite monarchy. Archaeology of the ancient Middle East offers extensive information about the material culture of the period, the items that these men and women saw and touched every day. The nature of the lives of the Israelite women of this era is especially important in understanding and interpreting these particular tales, and archaeology has helped us glimpse many aspects of their lives. The work of archaeologist Carol Meyers, also of Duke University, has proven especially valuable in assessing the roles of women in this society. Since these stories of specific women—Deborah, Ruth, and Hannah, as different as they are in terms of situations and emotions—share a special significance as tales of Israel’s transformation from fragmented tribes to a unified nation, it is appropriate to attempt to re-create the physical reality of this foundational era. Consequently, grounding the paintings in imagery that the characters themselves might plausibly have recognized from their own surroundings in Israel, with its ethnic influences and material culture sprung not only from within its own land but from as far away as Mycenae in the west and Akkad in the east, helps focus these characters’ perceptions of their own places in the world. So we have explored the intellectual wellsprings of these paintings. But a painting is not a museum catalog or theological treatise; instead, the illuminations that embody each of these stories attempt to offer a view into the hearts and minds of the characters. Note that I mentioned that in both narrative depiction and symbolism, the illuminations begin with a representation of reality that makes sense in the world of our own experience, as well as in that of the stories’ characters. Yes, these compositions have at their core a representation of solid physical reality; however, when we are wrapped in overwhelming emotions such as those experienced in these stories, we don’t always perceive our world in an orderly manner. A very special relativity changes the very way we see our surroundings. Soldiers have always described states of altered consciousness during the heat of battle. During the climactic moments of childbirth, I noticed that the scene around me no longer seemed to move fluidly but filtered through stress, pain, and excitement, images clicked by, like discrete cells of celluloid movie film (that dates me, doesn’t it?). More recently, when I held my husband’s head as his final breath caught and stopped and his pulse vanished, time itself slowed so that those few seconds thickened into what seemed like hours. In the aftermath, his stillness seemed to throw the movement of my every blood cell into high relief. Perceptions of moving upstairs with my friend Barbara, to tell my sons, parents-in-law, and friends took on the feel of a grayed and unearthly kaleidoscope. The raw emotions that haunt and enliven these biblical texts thus suggest at times an expressionistic approach to their visual interpretation. Thus, my challenge in creating the illuminations is to capture not simply the narratives but the in-the-moment experiences of the individual characters, whether in joy or sorrow, the adrenaline-charged excitement of battle or tender wonder at cradling a longed-for child. This challenge is not the same as surrealism; I am not trying to capture a dream (or nightmare) but rather to imagine and convey the character’s own reality and perceptions at the moment. The paintings focus, then, not simply on depicting the events of the passages at hand from an omniscient perspective but on imagining and conveying the emotions felt by the character through her or his mind, heart, and eyes. Even beyond conveying the characters’ emotional reality and their stories’ national importance, I am intrigued by the interplay of legend, in the form of the epic portions of these stories, with the kernels (or so they are presented to us) of actual human experience. Just as the dominant emotions differ in each of the three stories, the manner in which the legend grows from the human experience differs. My paintings attempt to reveal not only the emotions of the individual characters as above but to pick out the way in which the stories create their own legends for us—we who, more than three millennia after the time of their events, still eagerly read them. An illuminated manuscript is peculiarly suited for this emotional and intellectual conversation between reader and biblical character. As we sit at a table or curl up in an armchair with such a book, we have the leisure and solitude to dwell on the situations and emotions at hand, to allow the fusion of words, paintings, and colors, of vision and touch, to lead us into the character’s mind and heart. The quiet moment with the book affords us the opportunity to meld our own experience and intuition with the story and its images, to immerse ourselves in the tensions and the joys of the character’s experience. Clearly, much is packed into these paintings. Understanding their full import would be impossible without some explanation of the imagery, which, while grounded in the many sources related above, may be unfamiliar to the modern reader. Each story’s section of this book thus includes four elements. First, I offer a brief essay that lays out the themes and problems of the story and that introduces the rabbinic and other sources involved in my interpretation. Second, Arnold J. Band offers a brief and straightforward analysis of its literary qualities to assist you in enjoying the subtleties of the tale and the author’s skill at telling it. 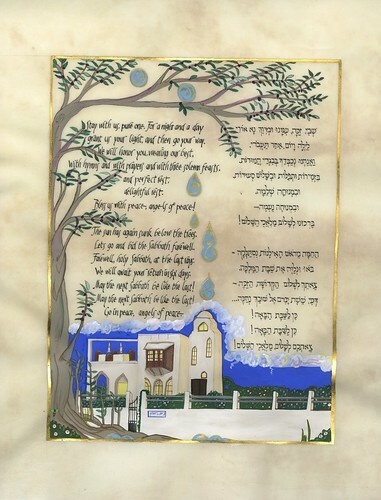 Third, you will find the uninterrupted body of its illuminations incorporating both the original Hebrew and the 1985 Jewish Publication Society translation. Last, but not at all least, for each pair of illuminated pages, I provide corresponding commentary that explains the images and symbols that I employ to convey the subtleties of the story and its constellation of ideas. 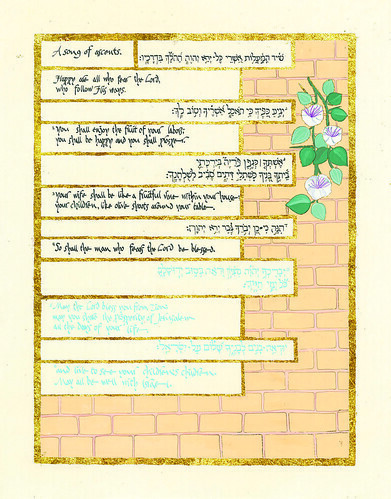 These commentaries will assist you in appreciating the many layers of moral, religious, emotional, historical, and national ideas–the visual midrash–embodied in the parchment, color, and gold. I urge you to dip into these materials as you peruse the paintings, so that you may fully enjoy both the biblical text and the imagery within the illuminations. Many readers may have questions about the physical nature of the original paintings and papercuts. 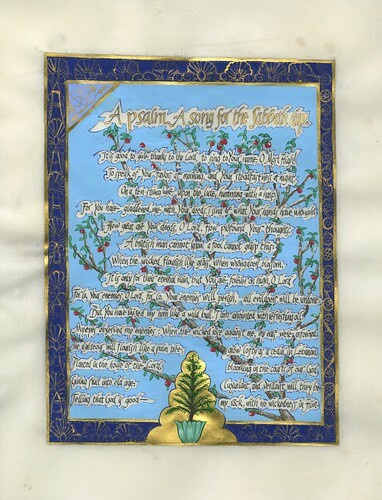 In terms of technique, the original artwork is a classical illuminated manuscript employing, with few exceptions, the same materials that have been used by European manuscript illuminators since the beginnings of the codex, the bound book. Except for the three papercuts that are indeed executed on paper, I created the 12” by 15” paintings on kosher slunk vellum, that is, calfskin that is taken from a very young calf and that, in Western art traditions is considered (and I concur) to be the finest of all surfaces for the combination of media used in illuminations. 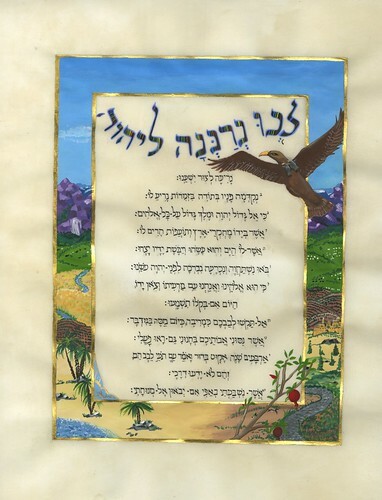 This vellum is also the preferred material for the finest Torah scrolls and hence is particularly appropriate, if not required, for the sacred texts presented here. The gold is 23-karat gold leaf or powdered gold, the silver is actually palladium leaf, and the paint the most delicate and brilliant gouache, or opaque watercolor, available to me. Some paintings also employ special paints made from ground gemstones: lapis, turquoise, malachite and rhodocronite. 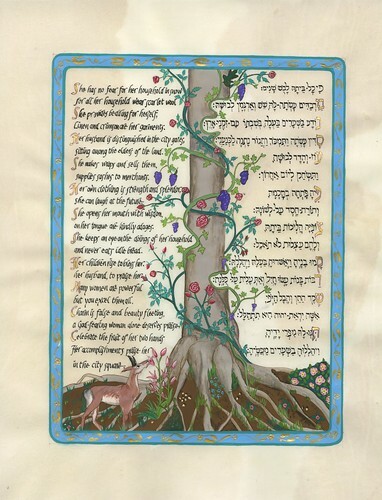 The Hebrew calligraphic hand is one that I developed for my first book, The Song of Songs: The Honeybee in the Garden, bringing together elements of several historical Hebrew hands in a style that I find both elegant and energetic. The English hand is the italic style developed during the Italian Renaissance, tempered and adapted by my own years of use. 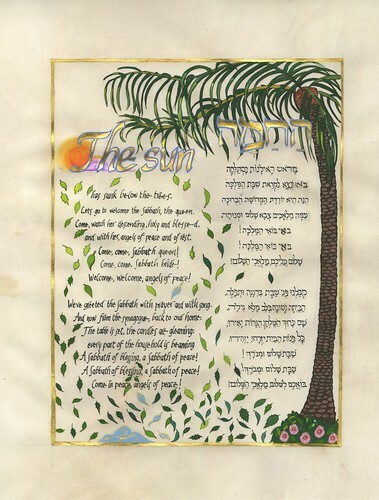 Paper-cutting has been a traditional element of Hebrew manuscript art, in particular ketubot (Jewish marriage contracts), since early medieval years; I accomplish this art using a blade (a great many, actually) on paper. I hope that these materials and methods bring you pleasure. period: the decades preceding the establishment of the Israelite monarchy. As distant as these inspirational women and men are from our own day, their brave and ultimately triumphant responses to their own trials offer us a window into the historical community of the people of Israel. I hope that the illuminations and commentaries will bring deep understanding and satisfaction to you who read the stories, gaze at the paintings, and imagine yourselves confronted by the challenges faced by these biblical women and men. Arise, then, and join me on this journey back into the early communities of Israel.